Thursday march 21st 1907 I got a little time to sit down this forenoon will and I went to town with Nell and the buggy in afternoon. I stopped at home. [Newt Parris?] was there Hattie rode to town with me. I had to stay for treatment Will drove home and I came at 5.20 The weather was very warm for the time of year. Friday March 22 1907 I got my work done and dinner mostly prepared before Mary Woolf came about ten oclock. She stayed all the afternoon and we had such a good visit. Will went to town in afternoon with the buggy. Billy busy about the place. 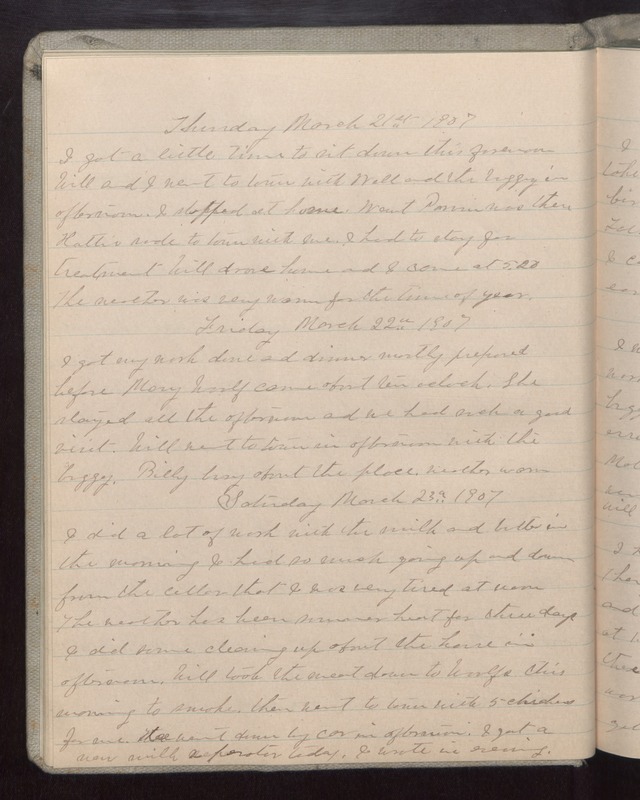 Weather warm Saturday March 23 1907 I did a lot of work with the milk and butter in the morning I had so much going up and down from the cellar that I was very tired at noon The weather has been summer heat for three days I did some cleaning up about the house in afternoon. Will took the meat down to Woolfs this morning to smoke. then went to town with 5 chickens for me. We went down by car in afternoon. I got a new milk separator today. I wrote in evening.